Last week I posted FS4enthusiast’s answers to the questions submitted to Adam Monana at Dinar Vets. I thought it was such a good idea I decided to give it a shot this week. If I were “Adam” this is how I might answer this week’s questions. The HCL has nothing to do with revaluation. The CBI raised the value a total of 26% from 11-1-2006 to 1-1-2009 without it, and they only did that because they had to in order to bring the inflation rate down. The CBI has never said they’re going to RV/RI. That’s what the gurus are saying. The CBI said that they’re going to RD (lop). They’ve also told us what the holdup is. They’re waiting for things to stabilize somewhat in Iraq because they need security forces in place to ensure a smooth currency changeover. Adam, it is possible that Maliki will be reelected as P.M. It’s been said that he has a “weak dinar” policy…desiring (for whatever reasons) to keep the dinar at it’s current low value. If Maliki is reelected, do you think this will delay the RV? There’s no RV to delay. See my last answer. Thanks Adam for all you. My question is what is your Intel is telling you about RV sometime this year? The reason I ask is because we are seeing the same thing regarding Iraq year after year and no RV. Patience can only go so far but after 10 plus years and still do not see any light at the end of the tunnel is getting very frustrating. I have no intel. All that stuff about having a CBI contact was just a ruse to sign people like you into my VIP program. Thanks a lot, by the way. Adam. 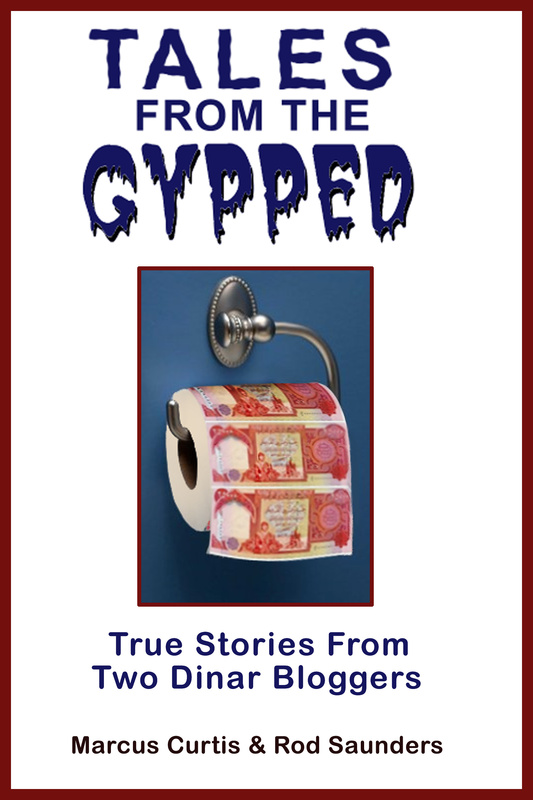 When you bought your first dinar were you thinking they would increase to the point you could get out a little ahead…….or…… did you think the dinar would open for a dollar or more? Or less? My “influencer” into the world of the dinar was convenced it would open for at least a dollar but hoped it might reopen for what it closed at before bankruptcy was declared. I had no idea what would happen, to be honest. I knew nothing about currency speculation and still don’t. (Isn’t it obvious? I can’t even do basic math!) I just figured I’d give it a shot, and then when I saw how many people were buying dinar I figured I’d probably make more money off of them than I would with the dinar so I started DV. By the way, there was no “bankruptcy” (Chapter 7 refers to the UN sanctions) and the dinar hasn’t been worth more than a tenth of a penny in about 20 years. Hey Adam, You made the comment a couple of times that the dinar we are holding has increased from the time we purchased it.nnI have been in this for 5 years and at that time the value of the dinar was .00085. Where is the appreciation. I paid roughly $1000 for a million dinar. What is keeping the kurds from settling up with Bagdad and getting the HCL completed and getting this RV completed?? News articles have stated how countries, businesses want to enter Iraq and start business relations. Are these people to “blind” to see the desert through the trees? I say lots of things. LOL!!! Doesn’t mean they’re true. Like I said earlier it did go up in value from 2006-2009, but if you bought after that you’re in the hole and will probably lose money. As for the Kurds, they don’t trust the Shias and Maliki is a Shia. They also don’t trust the Sunnis and Saddam was a Sunni. And the Sunnis don’t trust the Shia and vice versa. See how this works? They don’t trust each other and they don’t know how to build a modern, thriving, capitalist society and it will probably be another 20 years or so before they figure it out … if ever! Meanwhile you’re holding their currency thinking that somebody is gonna push the Easy button and fix everything and make you rich. And if somebody tells you it ain’t gonna happen you call them a dumper or anti-guru or troll. Gotta love it! Adam: With currencies in Turkey, Greece, EU in general, Argentina, South Africa losing their value and hyper inflation taking place, and now Ukraine going through Bank runs and civil unrest (brink of war) , home sales plunging 14% to 18 month low, China economy showing signs of collapse. The Fed, IMF and other controlling interest throughout the world are propping up countries with temporary loans. The “stimulus from the Federal Reserve” reversing course on the amount of money they “Place” in the stock market monthly which is one cause of the currency crashes which withdraws support for foreign countries. Talk has been discussed of a Global Reset on all currencies. I assume this would mean “all” currencies . What view would these factors have on your thinking the IQD would be involved at the same occurrence as mentioned earlier or would the IQD be independent of the imploding countries? The Global Reset is a bunch of hooey. The only ones talking about it are conspiracy nuts and dinar gurus. The only currency that affects the IQD is the USD because it’s pegged to the dollar and backed by the dollar. And as long as people buy gas and oil Iraq is going to keep pumping it and selling it for dollars. Whats your say on the LOP, do you believe them or is it just smoke? Adam, are there any exactly specific steps to be made by either the CBI or the MOF or the GOI that we should be looking for that will tell us that progress is being made toward IQD International Tradability at a new rate? The only steps toward making the dinar internationally tradeable would be building a diverse economy and producing products that have international demand which would then generate a demand for their currency. There’s no easy button for that, either. It will take decades. It appears that Maliki is trying to pressure the Kurds to pass the budget in exchange for him to have a third term as PM. Do you think this is likely? If it IS, I think we are in BIG trouble! It doesn’t matter who Iraq’s leader is, just like it doesn’t matter who is running the CBI. They’re not going to RV and make you rich. Adam…..can you explain the difference between USD & UST, and how will that effect our speculation? The USD is the US dollar, and the UST is the US Treasury that prints the dollar, and neither has anything to do with dinar speculation other than the fact that the dinar is backed by the USD. It’s all about economics and math. You can’t back 85 trillion dinar with $80 billion USD and RV more to more than 1/10 of a penny. Would we see the Budget and HCL approval announced in the gazette? How about the RV? The budget? Maybe, maybe not. HCL? Probably. RV? What RV? Again, see answer #1. The weekly Adam Montana Thank-A-Thon may now commence. And now for my question of the week to Adam. In your book Real RV Intel you stated that you “invested in the Kuwaiti dinar at the right time” which presumably was during Saddam’s occupation of Kuwait from August 1990 – February 1991. And in your interview with the ladies from the Earth Secrets blogtalk show in February 2011 you said “I had some money in the Kuwaiti dinar and I was able to buy that at the right time and made some money on that”. Now since you couldn’t buy Kuwaiti dinar on forex or through any bank while they were under occupation, and seeing as how you were born in 1976 I would very much like to know how you managed to get your 14 year old self over to the Middle East to conduct a little currency speculation on the Kuwaiti dinar during Desert Storm? P.S. There’s a battle currently raging between TNT Tony and three guys – the owner of Baghdad Invest, Mr. IQD, and a guy named Mike Diston whom Tony has been harrassing via his followers. I’ve stayed out of it so far as I’m more about informing than pounding the pavement. But I think it would be good to lend them our support as they hold this scammer accountable.